Image Size: 22 X 33 in. Image Size: 30 X 45 in. Sash-wearers were members of the Miwa‘tani or Mandan Society. The owl feather headdress was unique to this tribal fraternity and is associated with an owl-being that appeared in a vision of the founder. The wearers of the "society sashes" took on the obligation to stake themselves down to the ground with their sash during a desperate battle. They would fight in that spot until they were killed or until a fellow society member released them. 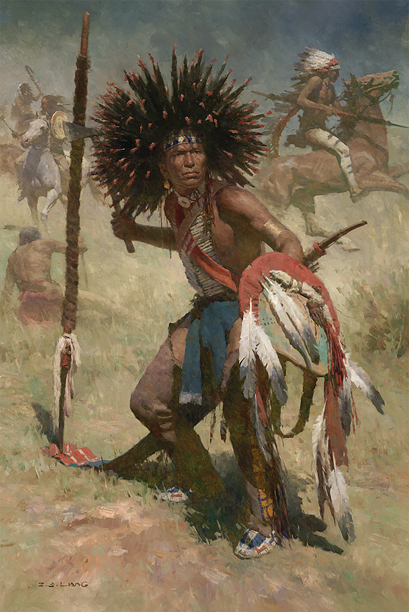 This warrior has fastened his sash to the earth with a spear and he is positioned in the middle of the battlefield where he will fight to victory or death, encouraging his brothers to stand against their enemy. The art of Z.S. Liang is regarded as some of the most important and beautiful paintings depicting the Native American experience being created today. His awards include David P. Usher Patrons’ Choice Award from the Masters of the American West Fine Art Exhibition and Sale and the President’s Award for Excellence from the Oil Painters of America.